EVEN A SMALL GENERATOR CAN KILL OR INJURE A PERSON REPAIRING SERVICE LINES WHEN THE ELECTRICITY YOU GENERATE BACK FEEDS THROUGH YOUR SERVICE ENTRANCE PANEL TO THE OUTSIDE UTILITY LINES. 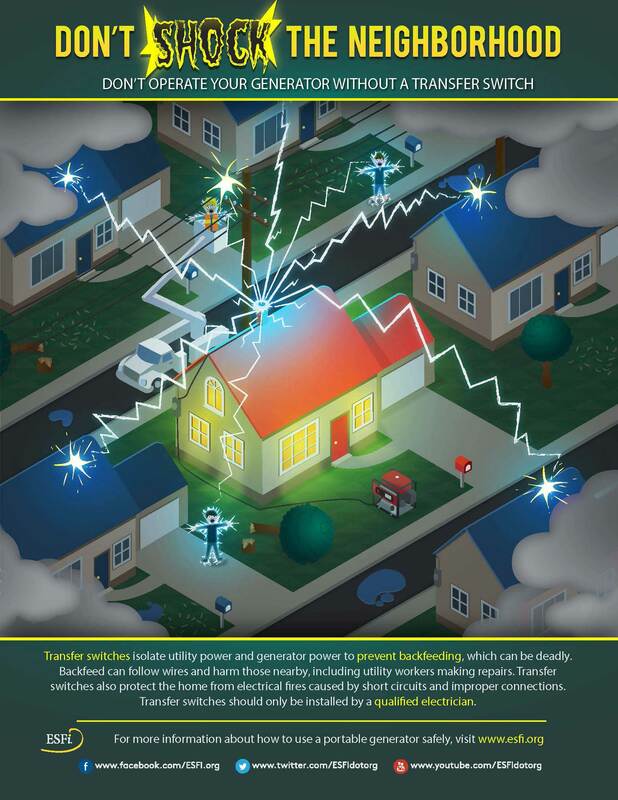 If Farmers' Electric Coopreative line crews are restoring power to your home while your generator is connected to the incoming utility service you could start a fire or seriously injure or kill someone. Portable generators require attention and proper use. They are also essential for maintaining power to critical life support equipment. But if they're used improperly they can kill you and the people restoring power. They can also damage the appliances you connect. Use caution when fueling your generator. For stationary generators that are permanently installed, a licensed electrician will need to install a "transfer switch" that complies with the National Electric Code. The switch safely cuts electricity to the power lines. Please call Farmers' Electric Cooperative at 660-646-4281 before you install a generator to ensure safety for yourself and line workers. Likewise, please call the Co-op if you currently have a stational generator installed so that our records can be updated--maintaining the safety of our employees.